MONKEYS ARE MY FRIEND: I Made Lace! I don't know why it is that when you crochet something out of thread, you are making a doily, but when you knit it, you are knitting lace. I mean, ultimately it's the same thing. Maybe because "lace" sounds cooler (and younger) than "doily"? 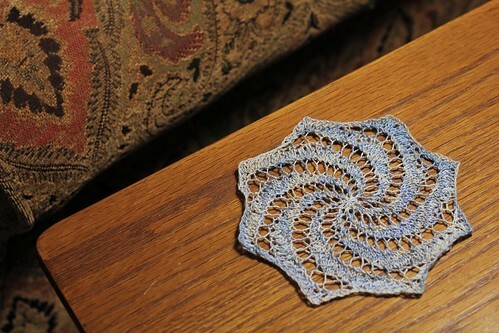 Regardless, I had some leftover thread from the pretty I made a little bit ago so I though I'd try my hand at knitting a doily with it. I think it turned out quite nice! I did make a mistake on it (which is fairly obvious to me but hopefully doesn't scream at any non-knitters too loudly) but I remember messing up and how I attempted to fix it so I pretty much know why it didn't work, which means hopefully I won't do that again in the future. That being said, the mysteries of knitted lace still confuse me. I mean, I totally get crochet. 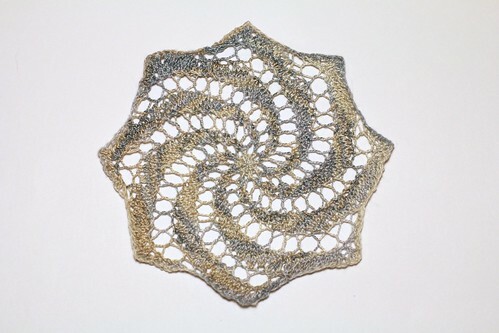 I can look at a doily and break it down and recreate it without needing a pattern. And I grasp the basics of knitting. I can look at something and know it is knit and know how the simpler stuff was done. But you start getting into yarn overs and increases and decreases and I just can't track the flow. I made this and I still don't fully understand why it turned out like it did! Well, logically, I kinda do. The bits where the lacy sections twist, well, I figure that has to be the knit rounds connecting them, right? But I don't' get why the combination of those stitches results in what it results in. I think this means I have a lot more to learn about knitting. Which is totally cool because I like learning. Just as long as it isn't too over my head. Maybe one day I'll understand why this turned out like it did!